Rose is synonymous with beauty and is majorly used as a chief ingredient in beauty products and skin care. 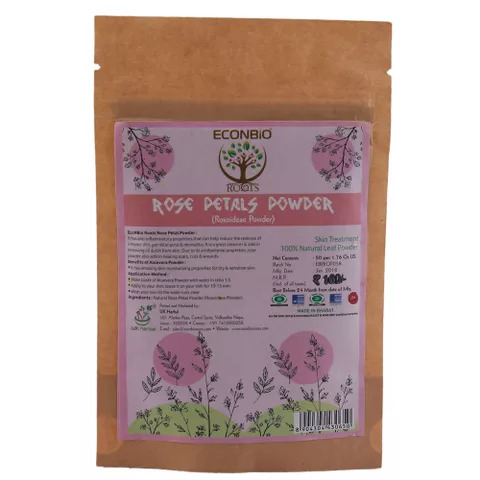 ECO & BIO ROOTS brings to you this fine quality rose petal powder in a packaging of 50 gms to provide fine quality products for beauty and wellness industry. 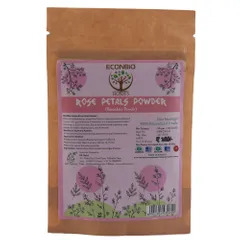 The rose petals are used for various skin related purposes to get a fair and glowing skin. It is useful against acne and fights of the dirt accumulation on the skin when it is applied, mixed with water as a natural toner for the skin. When it is mixed with cream, it protects the skin and acts as a effective sunscreen while thoroughly moisturizing the skin. It has a de-stressing effect on the skin when used in the form of a face-pack. It also helps fight the problem of dark circles and dark spots leaving the skin rejuvenated and soft and is ideal skin remedy for any skin type as it is mild. Make paste of Rose Petals powder Apply to your skin, leave it on your skin for 10-15 min. Wash your hair&skin till the water runs clear.